We welcome returning guests year after year, as well as invite new families to enjoy our exclusive, privately maintained & owned villa overlooking the Mediterranean Sea. We do not rent our beautiful villa through any agency & therefore offer a personalized service prior to & during your stay. Needless to say our excellently maintained summer home is ideal for your family holiday. 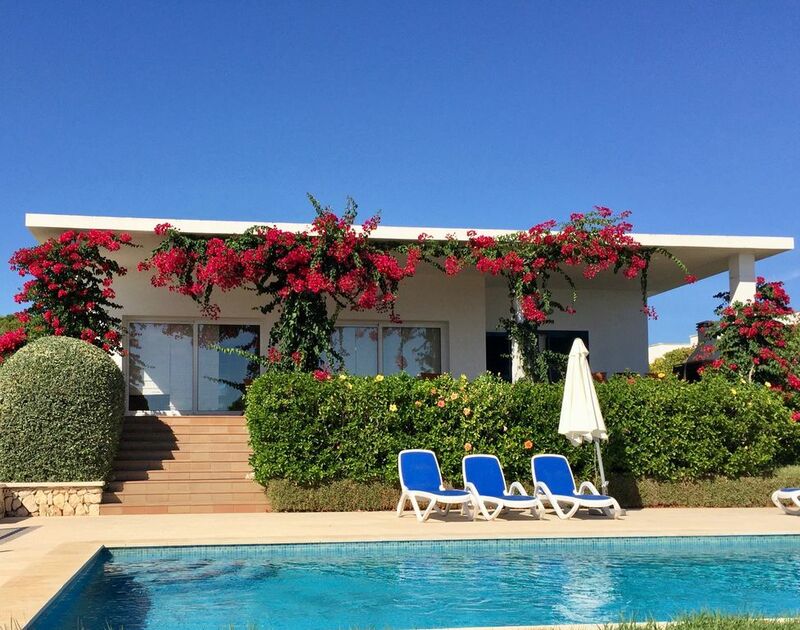 Our villa is modern, comfortable, spacious & south facing in one of the best locations in Menorca. It's open design living areas, on one floor mean it is accessible for youngsters and the more mature! The wide covered veranda offers peace, relaxation and the most wonderful sea views. The gated, landscaped garden with its well groomed lawn surrounds an 8 m2 private pool with roman steps surrounded by a large sun terrace ideal for sunbathing whilst keeping an eye on young swimmers. The covered porch also offers guests the opportunity to enjoy delicious meals cooked on the large built-in BBQ, the perfect opportunity to sample locally sourced fresh fish and other fresh produce. On those occasions our guests prefer to dine away, there are a surprising number of stellar local restaurants. We provide our guests with a free high speed internet, satellite TV, A/C throughout the villa, dehumidifier, security shutters, & travel safe for use during your stay. If you are traveling with young children we provide a cot, highchair, baby bath free of charge for your stay. A family friendly beach is just 5 minutes stroll along a flat path. Convenience stores, a lovely local bakery and coffee shop as well as other services can all be found nearby. Our villa is gated, in an exclusive area, set back from a very quiet road with parking for your car inside. To ensure holiday comfort the villa includes oven, hob, microwave, dishwasher, coffee machine, as well as a washing machine and tumble dryer in a separate laundry room. The villa is furnished to the highest standard throughout with bed linens and towels included. Guests are also welcome to make use of the Wii, children's toys, books & DVD,s during their stay. I am a British ex-pat, living and working in Spain for over 25 years. We chose this exclusive location for the stunning seaviews, tranquility and privacy it offers. We rate highly the proximity to the beach and port for sunny day sailing around the island. We also enjoy the easy access to Mahon for shopping and dining out in some of the great restaurants in the surrounding area. This is our summer home and not a rental villa, we want our guests to enjoy the maximum comfort that we expect whilst on holiday. We offer a unique owner to guest contact number to solve any issues that might occur as quickly as possible. We dehumidify & de-ant our property as well as replace linens, towels & kitchenware regularly. We take our guests feedback very seriously, & for this reason have many returning guests year after year. toilet, shower, Walk in large shower, bathroom ideal for family use. En-suite bathroom with large walk in shower, double basin, WC and bidet. Bathroom with large walk-in shower, WC & basin. Baby bath supplied for younger guests. Hairdryer also supplied. Also pool towels if required. Cream leather 3 plus 2 sofas and easy chair in reading corner. Books and magazines, Music centre, TV, DVD player with satellite dish for UK channels, Wii for guest use. Large kitchen fully fitted with microwave, oven, vitro ceramic hob, fridge/freezer, dishwasher and plenty of cupboard space. The dining area has a beautiful glass topped table and high back padded wicker chairs to ensure comfort and luxury at mealtimes. Suitable for people with mobility problems, the villa is on one level and pool area is accessible for wheelchair users. Roman steps and handrail aid entrance to pool. A car ramp and parking area access the villa at ground level. Notes on accommodation: Central heating and air-conditioning throughout the villa with two separate control panels. A safe is available for guest valuables. Suitable for families with young children, the elderly & wheelchair adapted. Strictly no smoking or animals. Outside: Gated property encloses a 650m2 colourful landscaped garden with perimeter wall and hedge. An 8m private pool with large patio area, equipped with comfortable sun loungers and large parasol. The south facing covered terrace has a large teak table and chairs overlooking the garden and pool. The bedrooms have access to private covered terraces and a generous car port offers parking space to one side of the property with easy access for unloading supplies. Utility Room: Washing machine, tumble dryer with an extensive indoor & outdoor drying area. Fishing equipment, inflatable boat, beach & pool toys are available for guests to use. Cleaning / Towels / Linen / Maid service: Towels and bed linens included and changed weekly. The property is also cleaned on a weekly basis, although a more freguent service is offered (prior arrangement with the owner). Guests can use the washing machine & dryer for personal items. Other: Spacious covered porch with teak table and chairs for guest to enjoy starlight dining. Built in BBQ adjacent to porch for guest use. Large terrace around the pool with 6 sun loungers and parasol. S'Atalaia is in one of the best locations on the island of Menorca, the villa is south facing, therefore it soaks up the best mediterranean sunshine and has excellent sea views from all living areas , as well as the covered porch and master bedroom. At night our visitors can sit on the veranda and listen to the sea, it is that close. The nearest family friendly beach is 5 minutes walking distance. Other beaches to visit by car or boat are Cala Caldena, Cala en Turqueta, Playa S'Enclusa and Playa Arenal de Morella Nova. Mahon airport 15 minutes drive away. Saint Luis town 8 minutes drive. Mahon harbour and nightlife 15 minutes drive away. Es Castell (most easterly point in Spain) 15 minutes drive. Mahon approx 8km. Es Castell 20km. Fornells 25km. Monte Toro 25km. Ciutadella 45km. Nearest shop 200m. Local shops, bars and restaurants, chemist and bank 2km. Booking Notes: 25% deposit required on booking. Balance due 4 weeks prior to arrival. Changeover Day: Preferred changeover day Friday - this can be flexible. Entry 2pm and departure 11am (this can be flexible). Notes on prices: Prices are for the property per week in UK pounds.